When I was a kid, I couldn't decide if I wanted to be a secret agent, a writer, or a businessman when I grew up. As a teenager, I decided I wanted to become an architect, so I studied mathematics and drafting. As I was growing up, my mother worked as a custom wiring lady for companies such as Universal Audio (later UREI) and Bushnell Electronics, who made custom API recording consoles. While in high school, on weekends and vacations, I would work part time with my mother at Bushnell Electronics. I learned how to solder, prepare wires for the wiring ladies, clean rest rooms, and run errands. Eventually, the engineers at Bushnell discovered I was a draftsman, so when I graduated high school, they offered me a fulltime job as their chief draftsman. Here is a photo at Bushnell of my mother Eileen Harrelson, Bill Brandt (one of their engineers), me (18 years old), and Alyce Ordman, another wiring lady. 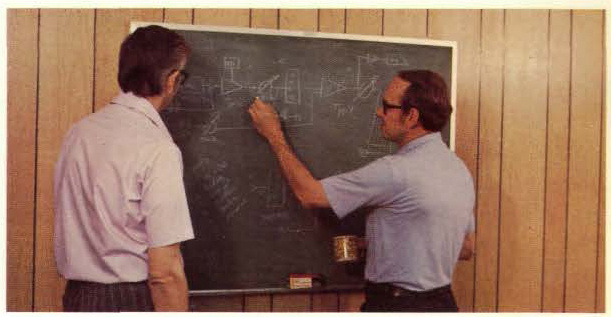 As I was drawing schematics for Bushnell, I would ask the engineers what it was I was drawing, and they answered my questions and recommended further reading. I was a sponge for new data. Bushnell hired a new design engineer, Deane Jensen (of Jensen Transformers), who asked me to be his technician on the weekends. For a while on my weekends, I would travel to different recording studios, helping Deane with whatever project he was working on, or doing drafting for him at his apartment. 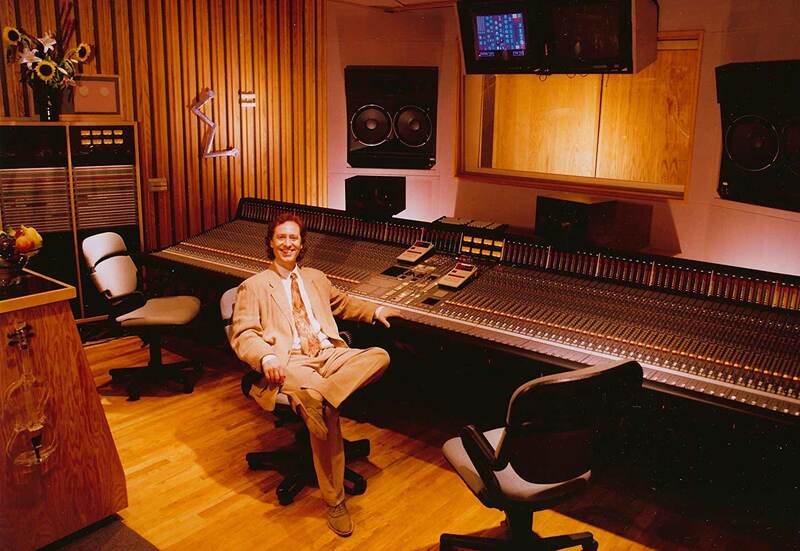 I remember working with him at The Moody Blues studio in the Malibu mountains, Sunset Sound Recorders in Hollywood, and many other famous studios of the time. On the left is a photo at Bushnell of Deane Jensen and Bill Brandt and on the right, Bill Brandt and Bob Bushnell. 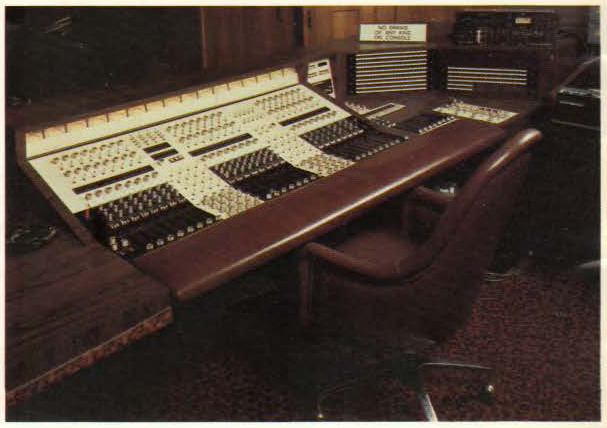 Here is a photo of Hollywood Sound Studio 'B' control room, with their Bushnell console. 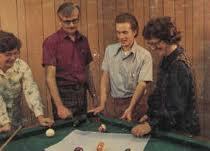 As the 80s came, the recording studio business seemed to be going. I left my job at Hollywood Sound and began a computer company. We sold, serviced and programmed computers. This lasted for about 6 years, at which time I sold the company and began consulting work. I programmed computers, repaired audio equipment, and designed electronic equipment. I did this for a few years and eventually found a tech job at The Enterprise Studios and Audio Affects in 1992. This tech job grew from working for two companies in 1992 into working for seven companies, 70 hour per week, as a technician, computer programmer, and company wide manager. When I left this job in 2002, I again went back to consulting. 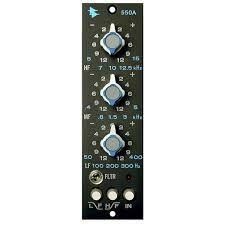 Around June 2005, I started working at Alive Sound, as a manager and technical lead. We repaired, installed, and modified pro sound equipment. This lasted until recently, at which time I started Objective Audio. 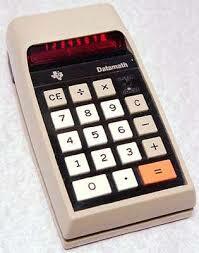 My programming interest began with calculators. One Christmas around 1976, Jesse Hodges, the owner of Hollywood Sound Recorders, gave out a bunch of hand-held calculators. George Massenburg received one, I received one, and other engineers working at the studio received one. 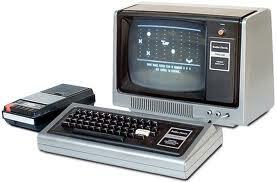 This was the start of my fascination with computing. 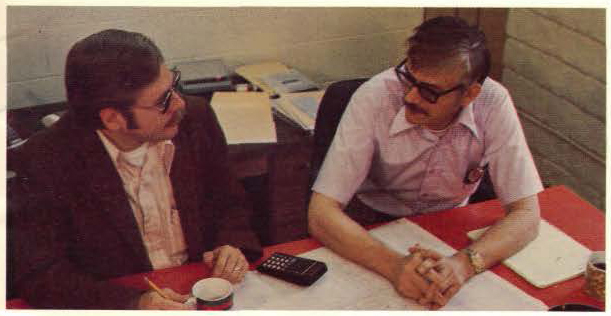 During this same period, I would frequently be working with or visiting Deane Jensen. Deane was in the process of writing electronic circuit analysis software for his Hewlett-Packard computer, software that later became the COMTRAN program. 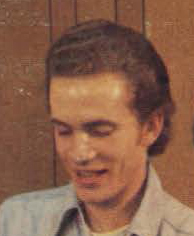 Whenever I was around Deane, my brain would be in "record mode," as I knew he was a genius. He explained to me how he used the software to optimize his transformer designs and improve his audio circuit designs. He also recommended that I get a Hewlett-Packard calculator and arranged for me to purchase one from an engineer at Crown International. 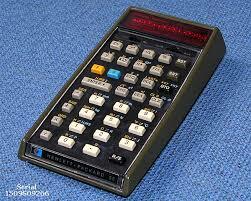 Once I got my first HP calculator, an HP-55, I started learning how to program. 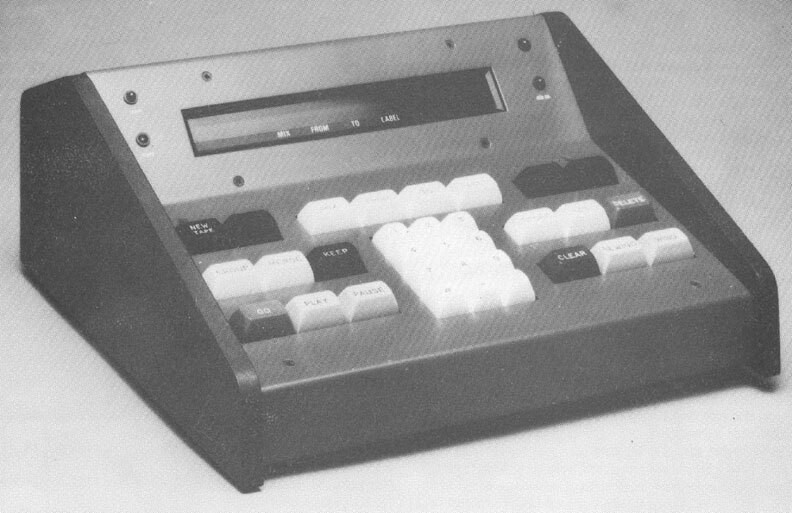 Around 1979, Hollywood Sound Recorders purchased a Radio Shack TRS-80 computer. The computer came with no user software, except the built-in BASIC programming language, a cassette recorder for storage, and a dot-matrix printer. So, I learned how to program in BASIC. I wrote a word processing program, an inventory management program, an accounting program for the studio, and many other programs. 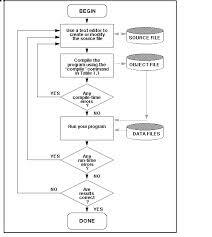 I learned how to program in assembly language to get the computer to display faster graphics. George Massenburg gave me a printout of a circuit analysis program written in another version of BASIC and I converted it to Radio Shack's version. In order to use the NOISE program found in the appendix of the book, "Low Noise Electronic Design," I learned the FORTRAN language so I could translate it into BASIC. At the time, I was taking a correspondence course in "Advanced Mathematics for Engineering" and I wrote software to check my homework on Fourier waveform analysis. 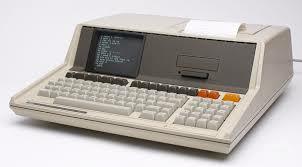 Although I learned a lot about computers with the TRS-80, the machine was frustrating to use, as it often crashed during use. Eventually, I saved enough money and bought a Hewlett-Packard 85 computer, which worked flawlessly. 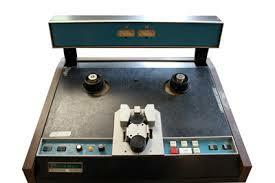 In the early 1980s, in response to client requests for 1/2" 2-track mixing recorders at Hollywood Sound Recorders, I converted 3M M79 2-track machines to handle 1/2" tape. We obtained the heads from Saki Magnetics, and I rebuilt the electronics around these heads, improved the sound quality of the record and playback audio circuits and lowered the distortion of the machine considerably. These machines were used for mixing many hits of the time. For one of my computer programming clients who used the Condor high-level database program, I wrote software to handle his company's payroll, which the Condor company said could not be done. Using curve fitting software, I developed polynomial equations to match the government's tax tables, which remained accurate within pennies for years. When the keyboard controller IC in the Neve NECAM console automation system became obsolete and no longer obtainable, I designed and built an interface and wrote software that allowed the system to be controlled from a standard IBM PC. The software also expanded the features of the NECAM system. I sold a few of these systems to studios around the world. One of my programming clients wanted to save his clients' money on their water bills. His clients, who included homeowners associations and municipalities, were spending tens of thousands of dollars a month on water. We developed a computerized system, which through feedback automatically measured the moisture in the soil and set the rate of the sprinkler systems to keep the moisture at an optimum point. During its first month of usage, it saved one of his clients close to $20,000. Hollywood Sound Recorders hired me for a project to re-build one of their custom API consoles, which was cumbersome to use and noisy. Over a six month period, I made the console modular, increased the number of aux sends, added sixteen inputs, re-designed the summing busses, re-designed the buss assignment circuit, and improved the sound quality. 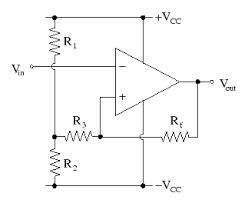 For the summing amplifiers, I used GML discrete op-amps. For other amplifiers in the console, I used Jensen 990 op-amps. Once done, the studio owner played back a tape he was familiar with to test it. At first he thought the console was not working and then he nearly blew the speakers out of the wall, since he used the noise level to set the main volume level and now the noise was gone. This console was used to record many hits, including Tracy Chapman's hit album "Tracy Chapman" and Danzig's "How the Gods Kill." While working for The Enterprise Group of companies in the 1990s, I was given the project to computerize the operations of their rental companies, which included Audio Affects, Enterprise Image, and Enterprise Live, and to manage their assets of over $25 million. I wrote the software in Foxplus using the multi-user SCO Unix operating system for pc computers. The system shared data between five locations spanning two states. The rental companies used this software to run their operations for many years. Also, while working for The Enterprise Group, I was given the project to design and build a high-resolution mastering console. Although this project never came to fruition, my research led to the development of an active balanced audio input circuit, and, more importantly, to expertise in this area. In the year 2000, I decided to go back to school to study business. I enrolled in Woodbury University's weekend college. It was a valuable eye opener. I was worried that at 46 years of age I wouldn't be able to keep up with the other students - quite the contrary, they couldn't keep up with me. When I finished my first semester and took my accounting final, I thought I was missing something and probably failed, since I was out of the class twenty minutes before anyone else. The professor told me I was the only one in his decades of teaching that had scored 100% on his final. 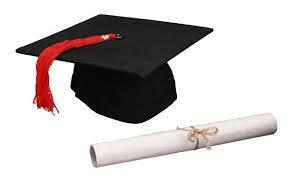 During my seven semesters, I earned a GPA of 3.97. The only class I didn't get an 'A' in was "Life Sciences," and that was because I didn't take it seriously at first. I learned that I know how to learn. I learned that most students don't know how to read. I learned that most students don't know how to write. I learned that much of what is taught as science is propaganda. I learned that most students don't know how to think for themselves.